I hope Ruby is not freezing at that college. What troubles me about her too is that she never gets an invitation to a really nice home or has a chance to meet any one. Although she sees more than the girls at home do, it is very monotonous for them tho they never complain. However some day, something may turn up for them (W4549). 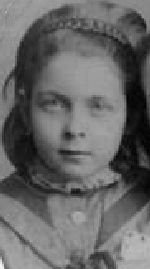 Ruby was nine years old when her father, Isaac, died suddenly and unexpectedly, in 1888. For many years, Isaac had suffered with alcoholism, depression and insomnia for which he took medications and treatment at Guelph (W2511). He died after taking a sleeping potion, or several, liberally mixed with alcohol. He also died bankrupt; he had lost the fortune that his father had earned in the foundry industry in Hamilton. His father had retired in 1865 with $500,000 and when Isaac died, he left debts of $900,000. He also left his wife, Mary Baker McQuesten, impoverished with six children between the ages of fourteen and two: Mary, Calvin, Hilda, Ruby, Tom, Edna, (Muriel had died before the age of two) (see photo at "Family"). Ruby's mother Mary gradually assessed each child for their ability to restore the family and she determined that Ruby and her brother Thomas, who was three years younger than she, had the greatest potential for education and earning power. Of the two, Tom, in the Victorian Age, being a man, held the greatest promise for achieving a professional education and career and of being capable of restoring the family to solvency and social status. However, Mary determined that Ruby could work as a teacher and send her money to Tom to put him through university. Ruby is the most tragic figure among the McQuesten children. She was very beautiful, charming, articulate, intelligent, scholarly, artistic, and very loving and caring. She became a teacher at twenty years of age, took a position at the Ottawa Ladies' College (sometimes known as the Presbyterian Ladies' College) in Ottawa and sent most of her money home to pay for Tom's education, and for household expenses (W5012). From 1899 to 1907 she endured the homesickness, the draughty old school, the long hours of teaching and the meagre pay, in spite of the fact that her health was failing (W4709). There were several epidemics at the school, Scarlet Fever and Grippe, and the teachers became the nurses. Ruby began to show symptoms of a throat condition in 1902. Finally, in 1907, just as Thomas graduated, Ruby fell ill and was unable to return to teaching that fall. Ruby corresponded regularly with her family, especially her brother Calvin with whom she felt a special affinity. Ruby's letters describe the course of her illness: the initial outbreak of "grippe" at the school, the recurring episodes, the diagnosis as bronchitis, the treatment for Tuberculosis at a Sanatorium in Alberta, and in Muskoka, her move to a cottage on Hamilton Mountain, and her gradual decline until her death on April 9, 1911. Ruby and Calvin were kindred spirits, and she often confided to him her homesickness and how much she missed him and the family. In spite of her poor health, Ruby's letters are always cheerful, affectionate and witty, full of interesting comments on lectures, books, religion, or the progress of one of her paintings. She was an accomplished artist and several of her paintings are on view at Whitehern. At a Hamilton Art School exhibition her work was reviewed as exceptional: "In sepia work the best thing shown for years is a castor plant leaf by Ruby McQuesten" (Newspaper Clipping n.d., MCP-Box 8). At an Art Show of her work at Whitehern in 2007, a critic wrote that she would have been a "significant woman artist" if she had had the leisure and health to indulge her talent. In some of Ruby's letters to Tom she acts as his mentor and muse and envisions his future career as a lawyer and politician and Member of Parliament. Her vision for him is as a moral leader in a "sin-blind" world of politics, which is precisely what he achieved (W-MCP2-4.053). David Ross, proposed marriage to Ruby in 1906. He was the son of Anna Ross, the principal of the Ottawa Ladies' College where Ruby was teaching. His sisters, Eleanor, Jean and Margaret, were also teachers there. David proposed marriage when he was twenty-four and Ruby was in her twenty-eighth year, which by Victorian standards, was already past the age of opportunity for marriage. The proposal occurred during David's visit to the McQuestens as they were vacationing in Muskoka (W5622). However, Ruby's mother, Mary, broke up this relationship. She objected on the grounds that David was too young, he was not yet established, and his financial prospects were not good. Also, she argued that David was irresponsible and was being dishonourable to his mother and sisters to consider marriage for himself, when he was not yet able to support them, and while they were all working, "his mother a poor worn out looking woman" (W5630). Also Mary did not approve of David Ross's plan to go West as a railroad surveyor, to build a log cabin for his mother, sisters, his deceased sister's three children, and Ruby, and to begin homesteading. This was unacceptable to Mary; she saw it as an impossible venture, and it did not suit her genteel sensibilities and high hopes for her children. Ruby attempted to appeal to her mother on the grounds that she would be able to do missionary work in the West, but to no avail. Mary insisted that they wait for two years - until David was "established." However, Ruby and David continued the relationship secretly in spite of the vow to her mother. When Mary discovered the secrecy, she was very angry and claimed that it brought on her "heart trouble," laying the blame directly on Ruby's already frail shoulders (W6135). Guilt was a powerful mover in the family, and duty and self-sacrifice were the models of moral behaviour, especially since Mary had already made so many sacrifices for her children, and for her church. Eventually, while Ruby was in the sanatorium receiving treatment, David Ross ended the relationship and Ruby "cremated" all of their letters, so we have no record of these "love" letters in the archive. In Mary's defence, at this time (1906) the family was in dire financial straits, and was constantly worried about maintaining and/or losing Whitehern, and there was no relief on the horizon. The family crises were mounting during the years 1906 and 1908 and their financial situation was desperate. The medical bills were relentless. Ruby was receiving treatment for "chronic bronchitis" which was finally diagnosed as "The Con" (consumption or tuberculosis). 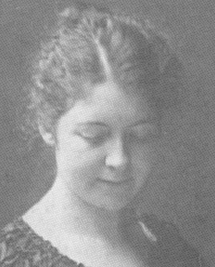 She finally had to give up teaching in 1907 so her income was lost, and she died in 1911. Edna suffered a mental breakdown and was sent to Montreal for treatment. Daughter Mary, was receiving regular treatments in Toronto for a skin condition on her face, and Mary had health problems herself. If it seemed that Mary's appeal to ill health was the matriarchal last resort, it was likely true, and it was effective. Therefore, Mary's most important reason for objecting to Ruby's marriage was likely the unstated one, that Ruby's income was essential for another two years, to put Tom through school, which was their only hope to bring the family out of their financial difficulties. This was especially true since Calvin, the eldest son, had not yet been able to establish himself financially, and Ruby, on occasion, was also sending money to him. 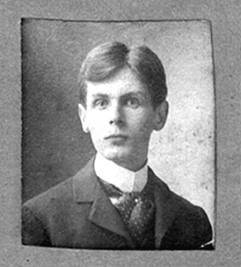 In 1906, Tom was twenty-four years of age and had not yet graduated or done his articling. Ruby received treatment in Calgary at a sanatorium and then to Gravenhurst at another san and finally to a cottage on the Hamilton Mountain where she died in 1911. Ruby was often treated with Calomel, a mercury compound given as a purgative to bring the fever down. It was extremely unpleasant and was later found to be toxic. Ruby is a doubly tragic and heroic figure of sacrifice. Ruby was sacrificed to the family cause, but she bore her lot heroically. She was sent away from her beloved home and family to earn money for Tom's education. She was denied marriage, and she gradually sickened and died of tuberculosis. Tom visited her regularly when she was ill and, with the help of his partner, Chisholm, rented a cottage on the Hamilton Mountain for her final months, so the family could be near her. Ruby never complained, but remained cheerful to the end. She died in 1911, at the age of thirty-one. She is buried in the family plot in the Hamilton Cemetery. Tom was always grateful to his sister and fulfilled her vision for him. He became an honest politician and refused any offers of "graft," and when he died he left a very modest estate. Thomas went on to achieve Ruby's and his mother's aspirations for him with his vast accomplishments in parks, highways and bridges, and eventually restored the family's honour and prestige, if not their wealth (see Thomas's bio). Thomas was their "saviour." Ruby is the "Tragic Victorian Heroine" of the story, but she did not die in vain.